Originally known as Тургор (Tension) in Russia and Poland. Later released in English and German and re-released in Russia with changes titled Тургор. Голос Цвета (Tension: Voice of Color). 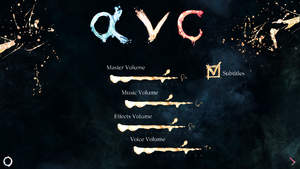 Bonus-content torrent – Comlete OST, artwork and concepts, 6 trailers including the earliest gameplay trailer, 2 videos from KRI (Russian GDC) and a Game Music Video from Pathologic by Halfgild Wynac. Polish version is based on Tension release (can be converted to the first russian edition with this). 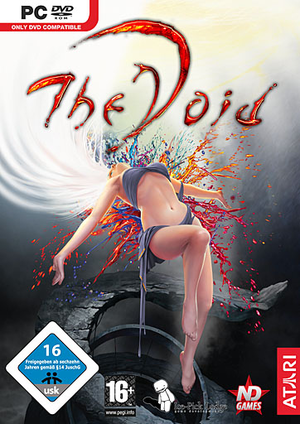 Russian version is based on The Void release. Game uses executable named Game.exe, which makes it difficult to tweak settings through GPU control panel. Config app supports only resolutions multiples of 4. See Widescreen resolution. Stretched videos. See Widescreen resolution. Use The Void - motion sickness mod. If mouse smoothing is set to zero, causes uneven mouse movement which causes stuttering. 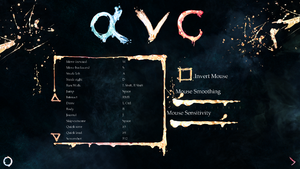 Increase mouse smoothing to decrease the effect significantly. Rendered image uses SDR color space. 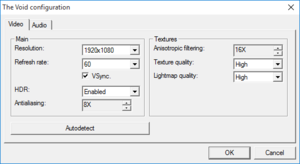 HDR option refers only to HDR Rendering. Paste following content into the file. 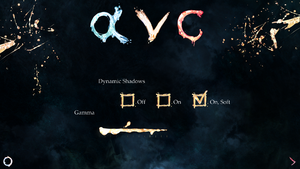 You can customize graphics settings as you like. Open config.xml with a text editor. Find <Fullscreen /> and delete it. With Tension, subtitles can be patched. Usage of russian dubbing is recommended, because of timings. Both Tension and The Void versions. Attempting to start the game or the configuration utility results in the error message: Failed to choose the optimal settings preset for your video card. Minimum settings were selected. Locate the game executable <path-to-game>\bin\win32\Game.exe. The Void requires PhysX v2.5.2 which is not included in Nvidia's PhysX installers. 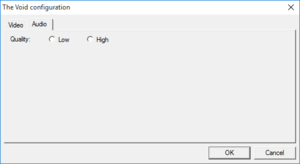 Install the NVIDIA PhysX System Software. Install the NVIDIA PhysX Legacy System Software. Install the AGEIA PhysX Engine v2.5.2. The game should now start up and play. The game isn't "censored", the characters are eventually fully exposed. Create the file girl.xml in <path-to-game>\data\Properties\World. ↑ 2.0 2.1 File/folder structure within this directory reflects the path(s) listed for Windows and/or Steam game data (use Wine regedit to access Windows registry paths). Games with Steam Cloud support may store data in ~/.steam/steam/userdata/<user-id>/37000/ in addition to or instead of this directory. The app ID (37000) may differ in some cases. Treat backslashes as forward slashes. See the glossary page for details. This page was last edited on 14 April 2019, at 10:25.